Low level chiropractic laser therapy was developed over 35 years ago. It is used for many ailments and is an emerging therapeutic approach for healing at the cellular level. The process is similar to photosynthesis in plants. Sunlight is absorbed by the plant and is converted to energy that the plant uses to grow. 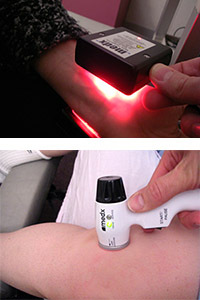 Laser therapy is painless and can be described as holding a flashlight to your skin. You don’t feel anything but you may be able to see a slight illumination of the skin around the treatment area. Essentially your cells have photoreceptors which absorb light, especially light found in the red-near infrared spectrum. This light stimulates cellular functioning moving it away from the disease state by increasing intracellular ATP production which we use as an energy source. Ultimately this leads to more energy for the healing of soft tissues such as muscles, tendons and ligaments as well as improved wound healing and repair of damaged tissues, bone, nerves and cartilage. Chiropractic laser therapy can also be used for chronic pain syndromes by lowering inflammation and normalizing diseased and dysfunctional tissue. It works very nicely on low back pain, neck pain, hip and knee pain as well as TMJ dysfunction and carpal tunnel syndrome. 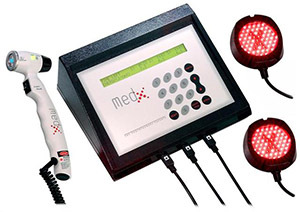 Laser therapy can be used as a stand-alone treatment or in conjunction with other therapies such as chiropractic manipulation, physical therapy and acupuncture. We find laser to be most helpful on patients who have chronic issues with pain that has lasted for months and years. Simple treatment with laser is painless and easy and will usually help those patients who have tried almost everything else for their problem with minimal to no relief. Simply put if you’ve tried everything else and are frustrated because you haven’t gotten the results you wanted, it would be worth a trial of laser therapy. Laser is the safest modality available and there are no side-effects from laser except feeling better. Efficacy of low power laser therapy and exercise on pain and functions in chronic low back pain; Lasers Surg. Med. 32:233–238, 2003.